Break away machine pin header, 0.1" pitch, 40 pin, male, gold, vertical, surface mount posts. Designed for 1.50 mm diameter pad land pattern. Pins are 0.45 mm (18 mils) in diameter. Although these machine pin headers are technically break away, we recommend cutting them apart using a blade to achieve a smooth edge. A box cutter works well, with the plastic header body supported on the edge of a block of wood. Machine pins have a smaller diameter that better fits production board through hole footprints, especially for DIP package replacement. 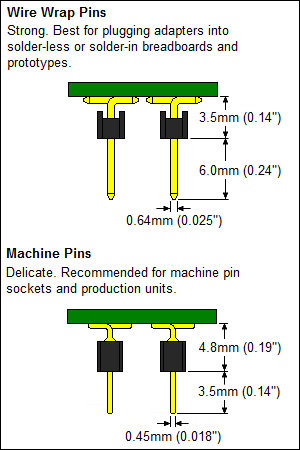 We recommend machine pins (0.45mm round) for production adapters. Machine pins are very strong once soldered, but can be delicate and bend easily when repeatedly plugged in and unplugged from a prototype breadboard or socket. 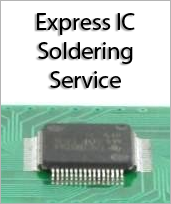 For prototype applications, we recommend using our wire wrap (0.64mm square) pins.